Fort d'Auvergne Hotel in St Helier, Jersey is located right beside the seaside and an easy walk into St Helier town centre. There is only a pedestrian promenade separating the hotel and the sea shore. The hotel has a large private seafront sun terrace area for the exclusive enjoyment of its guests and luxury indoor swimming pool complex. 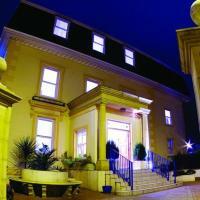 The Hampshire Hotel is a newly refurbished 3 star hotel near the centre of St Helier, Jersey. Located on Val Plaisant, St Helier, The Hampshire Hotel is just a ten minute walk from the town centre and all it has to offer. Awarded Trip Advisor "Certificate of Excellence 2012". Heated outdoor swimming pool (seasonal). Located on La Colomberie. 5 minutes walk from the centre of St Helier & Howard Davis Park. Havre de Pas sandy beach under 10 minutes walk. Sun patio, table tennis, pool, TV/ games room. Live entertainment in summer. Free Wi-Fi in public areas. Free parking. Garden. Ciao! Coffee Shop. Originally built in the 1800's as a gracious private home, nestled against the cliffs of the wonderful wooded valley of Rozel, the Chateau La Chaire Hotel in Jersey is now recognised by the major guides as one of the finest small luxury hotels in the British Isles. The Club Hotel & Spa is in the centre of St Helier, Jersey. It is a stunning 4 star boutique hotel which offers luxurious accommodation, a spa, indoor & outdoor swimming pools and Bohemia Restaurant, run by Michelin-starred chef Shaun Rankin which has 4 AA rosettes. Indulge yourself with a range of relaxing spa treatments, massages, a dip in the salt water pool, salt cabin, sauna and steam room. 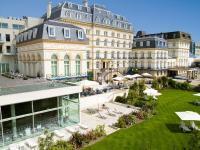 Hotel de France is a stunning 4 star luxury hotel just 1km from St. Helier, Jersey. It has been family owned (for the past 35 years) and offers superb spa facilities and an award winning a la carte Saffrons Restaurant which serves Indian fusion cuisine. Rooms include deluxe suites with separate living areas, family rooms and romantic contemporary style spa rooms with views over St Helier.